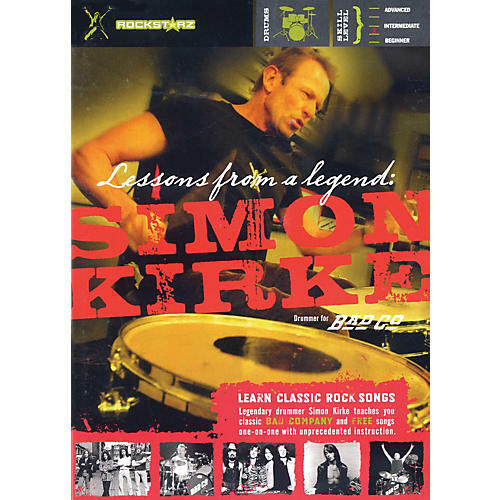 Legendary Free/Bad Company drummer Simon Kirke teaches you how to play six classic songs, with unprecedented one-on-one instruction. Simon analyzes each song and its beat, and instructs you on the breakdowns of his legendary fills. You can learn by watching the full original track, the drum track only, or play along with the original track minus the drum parts. Songs included are: All Right Now · Can't Get Enough · Shooting Star · Movin' On · Feel Like Makin' Love · Rock and Roll Fantasy. Bonus materials include live concert footage, and an in-depth interview with Simon detailing his musical approach. 90 minutes.